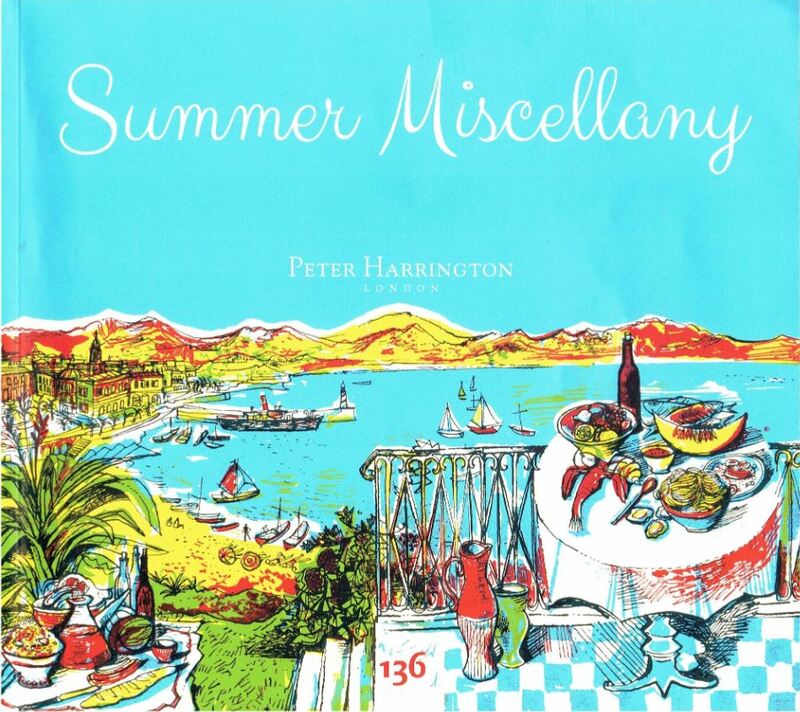 Peter Harrington of London has created a catalogue called a Summer Miscellany. Perhaps we are slightly late getting to this one. Then again, maybe it's targeted to people in the Southern Hemisphere and we are getting an early preview. Whichever, there are lots of interesting books on varied subjects available in these pages. Here are a few examples. We begin with a book that ties the Old Country to the New, mothership and former colony. Item 52 is Last of the Great Scouts: The Life Story of Col. William F. Cody "Buffalo Bill." As Told to His Sister. Evidently, Bill was not too good at writing, so Helen Cody Wetmore took on the task. Obviously, Buffalo Bill liked his sister's portrayal of him as he has inscribed this copy of her book in 1903 to the Lady Mayoress. That would be Clara Mary Southam, wife of Shrewsbury Mayor Herbert Southam. Cody brought his Wild West Show to Shrewsbury in England on May 30, 1903, part of his major tour of Europe from 1902-1903. The tour had been promoted with explanations that it was traveling with four special trains, 800 people, 500 horses, and mounted warriors depicting "all Virile, Muscular, Heroic Manhood has and can endure." Whether this was actually true or more Buffalo Bill hyperbole I do not know. This copy is from a promotional edition of Wetmore's biography published in 1903, the original having been released in 1899. Priced at £1,750 (British pounds, or approximately $2,361 in U.S. dollars). Charles Darwin studied the evolution of numerous organisms, but these have to be among the strangest of all. Plant eating animals are herbivores, and meat eating animals carnivores, but what are meat eating plants? Darwin had a name for them – insectivores. Darwin thought the meat-eating plants ate only insects, but they can eat small lizards and such as well, so perhaps his term is somewhat dated. Item 67 is his investigation of Insectivorous Plants, published in 1875, 15 years after his ground breaking theory of evolution by means of natural selection. What Darwin concluded was that these plants had adapted remarkably to an environment poor in normal nutrients. Instead of obtaining nourishment through their roots, they were able to attract and trap insects, some through sticky substances, others through motion, closing a trap. They also had developed the ability to produce enzymes to break down the trapped animals and convert them to food. Offered is a copy of the first impression of the first edition. £3,000 (US $4,051). Here is an unusual book, a great one for anglers, those who fish with a pole and hook. It is Trout Fishing From All Angles, by Eric Taverner, of whom Harrington notes that his works are regarded as "authoritative guides" in the fishing community. It comes from a signed limited edition, #168 of 375 copies, produced for the Lonsdale Library series. It includes a sepia frontispiece and 49 tipped-in plates. What is most unusual is it also includes 30 hand-tied fishing ties in the rear. Handle this book with care. Item 4. £2,000 (US $2,702). Item 47 is a wartime broadside of the Atlantic Charter, published by the Office of War Information in Washington in 1943. The Atlantic Charter was a document put together by President Franklin Roosevelt and Prime Minister Winston Churchill in August of 1941. It was soon adopted by various other Allied nations, many represented by European governments in exile by then. The Charter made various promises to the world as to what the Allies would do after the war was over and the Axis powers defeated. It promised the U.S. and U.K. would seek no territorial gains, people would have the right to self-determination, trade barriers would be lowered, there would be freedom of the seas, aggressors would be disarmed but even vanquished nations would have better economic conditions and improved social welfare. The agreement came about as a result of a secretly arranged meeting in Newfoundland between Roosevelt and Churchill. No actual document was created at the time, it was never a treaty, it wasn't even called the Atlantic Charter until later. The U.S. wasn't a participant yet in the war, and a victory by the Allies, at that point not much more than a battered England and governments in exile, was hardly assured, or even likely. This official printing did not even come about until 1943. Still, the Atlantic Charter was important as it bound America more closely to Britain and its cause, even if it would not be until December and Pearl Harbor that President Roosevelt was finally able to get the approval he wanted to join the Allied cause militarily. £2,000 (US $2,702). Item 151 is a copy of the third and "definitive" edition if Isaac Newton's Philosophiae Naturalis Principia Mathematica, published in 1726. It is "definitive" because it was the last published in Newton's lifetime. As such, it was his last chance to update and make corrections to his work, and it is the one on which all later editions were based. Printing and the Mind of Man calls it "the greatest work in the history of science." Not bad considering the level of competition it is up against. This is one of 200 large paper copies (there were 1,000 on ordinary paper and 50 on the largest paper). £27,500 (US $37,126). Peter Harrington may be reached at 020 7591 0220 (USA 011 44 20 7591 0220) or mail@peterharrington.co.uk. Their website is www.peterharrington.co.uk.